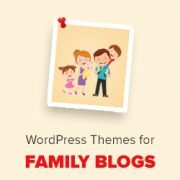 Are you looking for best WordPress themes for your family blog? A lot of folks use WordPress to build small family websites. This allows them to easily share family news, events, and photographs with their friends and family. 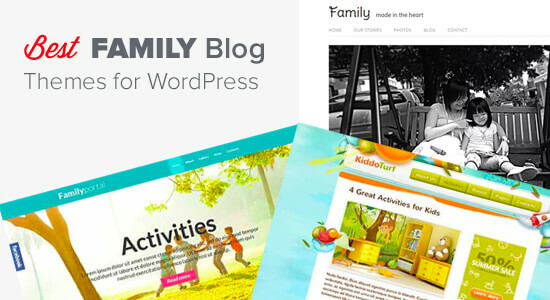 In this article, we will show you some of the best WordPress themes for family blogs. First, you need to choose the right platform for your family blog. When we say WordPress, we mean self hosted WordPress.org sites. See our guide on the difference between WordPress.com vs WordPress.org. To start your WordPress blog, you will need a domain name and web hosting. Your domain name is your website’s address on the internet (e.g wpbeginner.com), and web hosting is your website’s home on the internet. We recommend using Bluehost because they’re offering our users a free domain name and 60% off discount with our Bluehost coupon code. Not to mention, they are an official WordPress.org recommended hosting provider and among the largest hosting companies in the world. This is why they’re also #1 in our list of best WordPress hosting companies. Next, you will need to install WordPress. Follow the step by step instructions in our WordPress installation tutorial. Now that your website is up and running, it is time to choose a theme for your website. Select a theme from our expert pick of the best WordPress themes for family blogs and then follow the instructions in our how to install a WordPress theme tutorial. 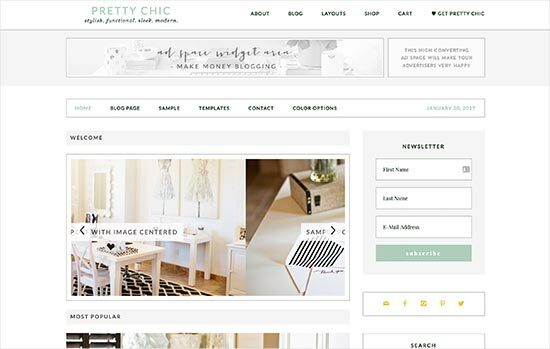 Pretty Chic is beautiful stylish WordPress theme built on top of Genesis framework. 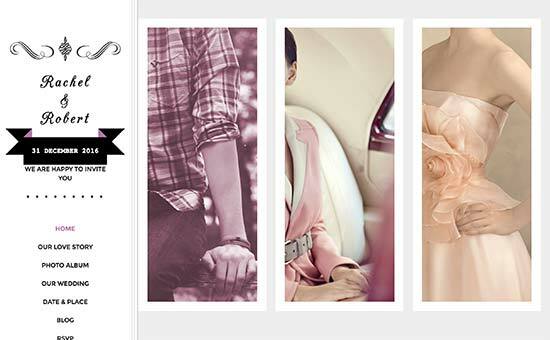 This stylish theme is well-suited to be used for family blogs, wedding websites, baby blogs, etc. It comes with 3 navigation bars, a full-width widget area, and beautiful page templates. Family is a minimalist free WordPress theme for family blogs. It is designed to showcase your family photographs with minimal clutter. It is a child theme of Omega and inherits all its capabilities including custom logo upload, custom header, custom colors, custom menu, custom CSS, and custom header via featured image. 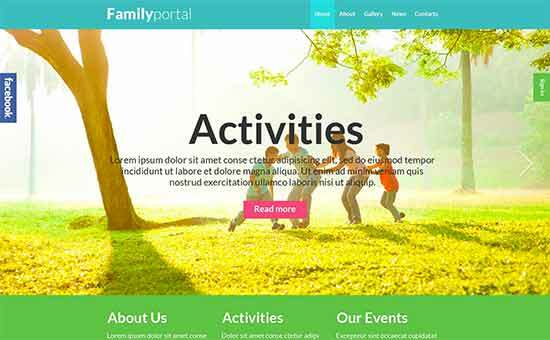 Family Board is a bright WordPress family blog theme. It uses bright colors and features a slideshow of latest posts on top using full width images. Apart from that it comes with multiple post formats, built in support for galleries, custom header, widgets, and 80+ shortcodes. It is fully customizable and quite easy to setup. As the name suggests, Wedding Day is a WordPress family blog theme designed for wedding websites. It features a filterable photo album to easily share photos, a countdown timer, an RSVP form, and events section. It allows you to easily share wedding photographs with friends and family, share event details, guide guests to location using Google Maps. 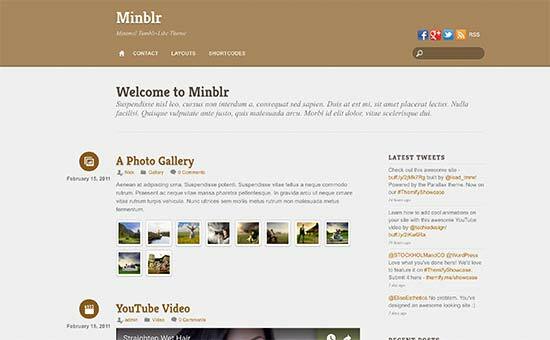 Minblr is a responsive, tumblr like microblogging theme. Ideal for personal and family blogs, it comes with 10 skins, multiple page layouts, multiple widget areas, and support for post formats. 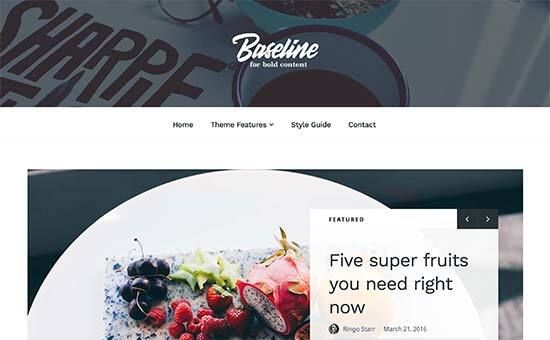 Baseline is a minimalist style WordPress theme suitable for family, photography, and personal websites. It is also an ideal theme for magazine websites. It comes with featured content carousel, category header menu, and stunning typography. It comes with multiple page layouts, custom widgets, social media integration, and easy theme setup panel. 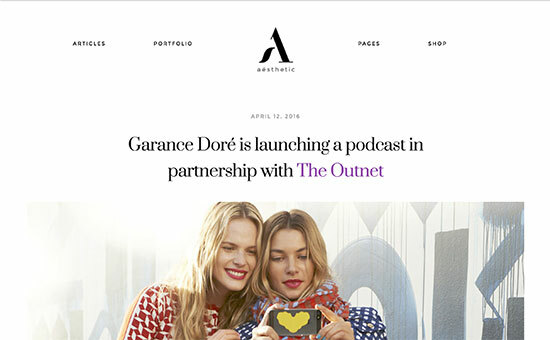 Aesthetic is a modern WordPress blog theme. It is designed to elegantly display images which makes it ideal for family blogs. It comes with a visual drag and drop builder, contact form, slider, mega menu, and lots of other features you would expect from a premium theme. Kiddo Turf is a WordPress theme for kids related websites. It features bright colors, beautiful illustrations, and a joyful look. Paperbag is a minimalist WordPress theme for family blogs, personal or photography websites. Image display and beautiful typography are the two most stunning features of the theme. It comes with multiple layout choices, 20+ color and template schemes, theme customizer, multiple sidebars and widget ready areas. Candid is an elegant WordPress theme ideal for personal and family blogs. It is focused on displaying your photographs beautifully, which makes it ideal choice for sharing family photos. It is highly customizable using the live customizer. You can choose your own colors, upload logo, background, etc. Candid uses Abril Display, a clean and sophisticated serif font. 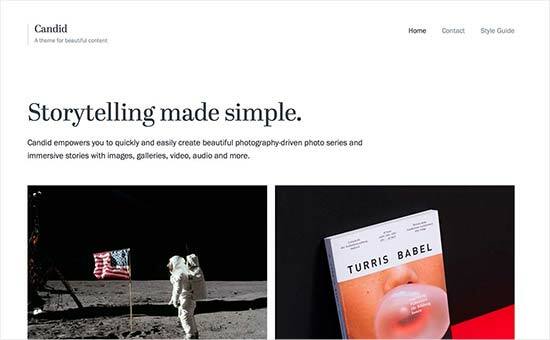 Extant is a free WordPress theme designed for photographers. This makes it a perfect choice for sharing family photos. It has a top bar as header, sliding panel menus, slide panel search, colors, custom background, and multiple layout choices. 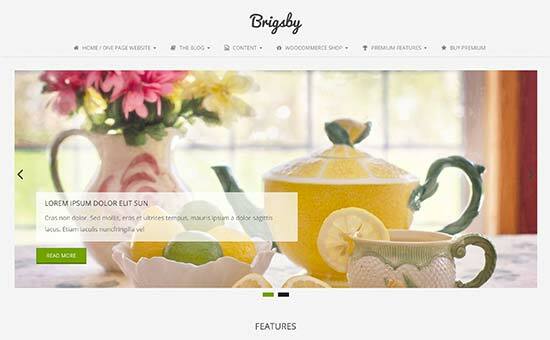 Brigsby is a beautifully designed free WordPress theme. It features light color scheme with beautiful display of featured images. It is a multi-purpose theme so it can be easily used for a blog, personal and family websites, photography and even magazine sites. It comes with two navigation menus, social menus, and live customization. 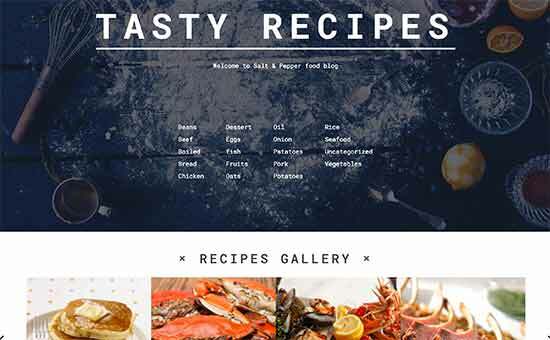 Salt and Pepper is a WordPress recipes theme crafted to be visually stunning. It is ideal for a family website with food and recipes related content. The theme includes a handy recipe filter, ingredients list and cook methods. The homepage has a section to beautifully display recipe gallery. It also has a blog section and tons of customization options to make this theme truly yours. This free WordPress theme is designed for wedding websites and is perfect for all kind of family blogs. 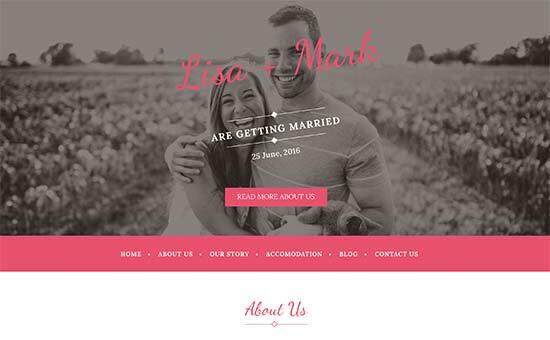 As a wedding theme it features a front page template which can be setup using theme customizer. Large header images, beautiful menus, and elegant typography make it an ideal choice to share your special day with family and friends. 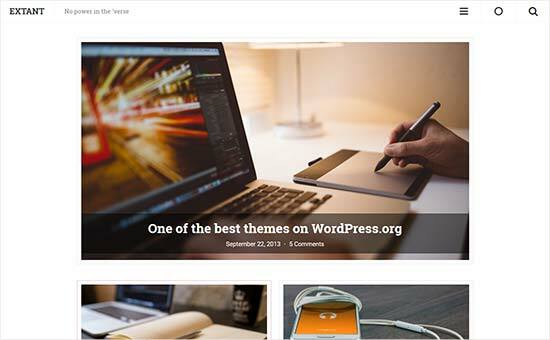 Hueman is one of the most popular free WordPress themes. It is a multi-purpose theme that can be used for any kind of website including family blogs. Hueman comes with two and three column layouts. It also has two navigation menus, social menu, custom widgets, custom header and background support, and multiple widget ready areas. 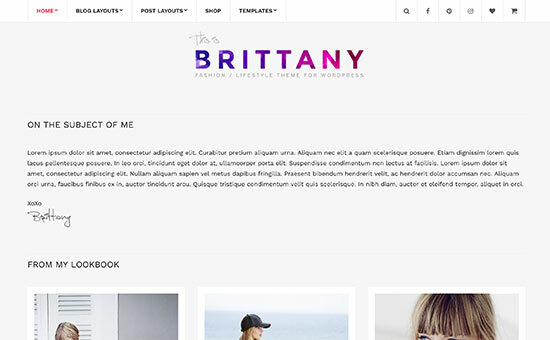 Brittany is an elegant multipurpose WordPress theme. It is a blogging theme with gorgeous typography and beautiful display of images. Perfect for family blogs with lots of photographs, videos, and text. It comes with tons of customization options like custom colors, widgets, header, background, etc. It also supports WooCommerce out of the box. 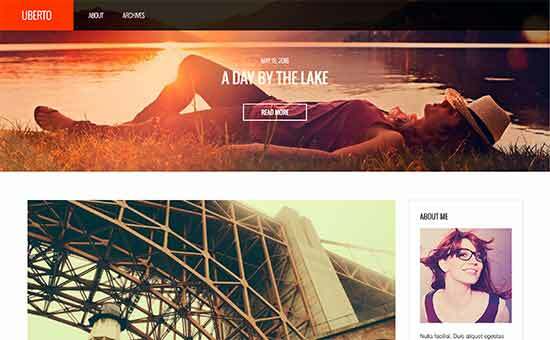 Uberto is a bold WordPress theme suitable for personal and family blogs. It comes with multiple color schemes and even lets you assign color schemes on per page basis. It includes several custom widgets for content discovery, social media, flickr, Twitter, etc. It is very easy to customize and setup. 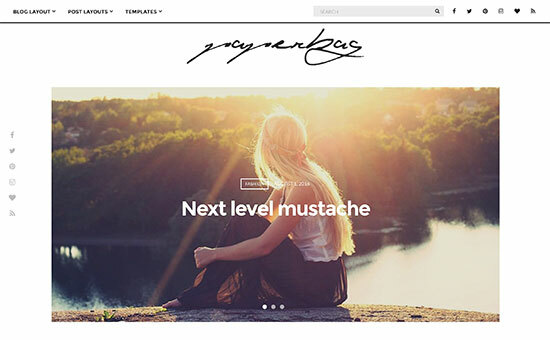 Memories is a stunningly gorgeous WordPress theme with focus on photography. It is perfect for photography, fashion, and family blogs. It comes with 2 and 3-columnn layouts, multiple page templates, and multiple color schemes. With custom widgets and tons of customization options you can uniquely tailor it for your family blog. Peak is a multipurpose WordPress theme with unique grid based layout. With its focus on the beautiful display of photos, Peak is perfectly well suited for family blogs to share photos, events, or general news. It has sliding menus, sliding sidebars, full-width single pages, and multiple layouts for the display of single posts. It also comes with a mega menu showcasing your most prominent entries. 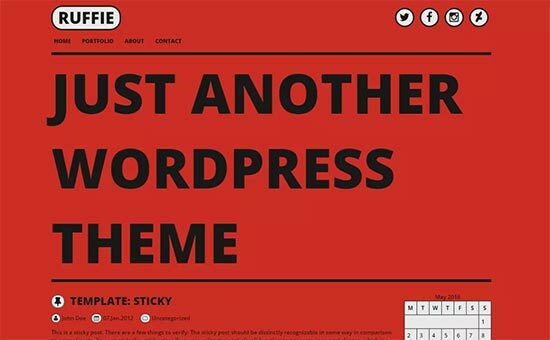 Ruffie is a uniquely bold free WordPress theme. Inspired by comic books, this theme features bold typography and colors. It comes with 6 color schemes, social media icons, breadcrumbs, and 7 widget ready areas. It is easy to customize using the live theme customizer. 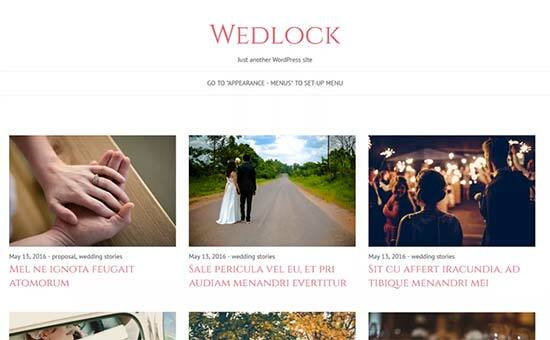 Wedlock is a WordPress theme for wedding websites and other family events. It features a simplistic approach to design focusing on photos and typography. It comes with page templates, custom header and background, widget ready areas, and live customizer. 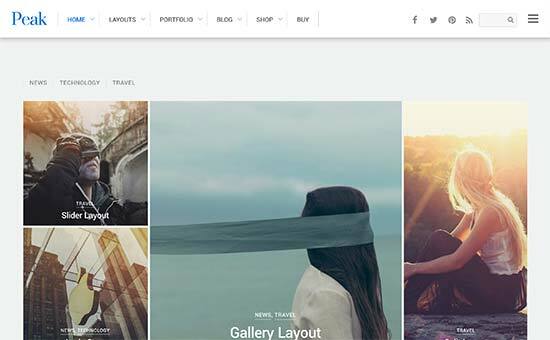 This beautiful WordPress theme is designed specifically for sharing photographs. 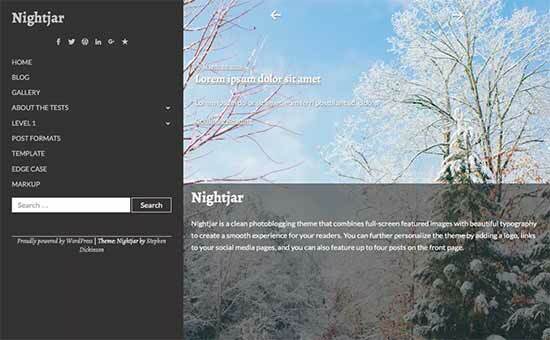 Nightjar is the perfect theme for family blogs, photography, and blogging. It features fullscreen featured images and beautiful typography. You can set it up to feature upto four posts on front page, add your own logo and social media profiles. 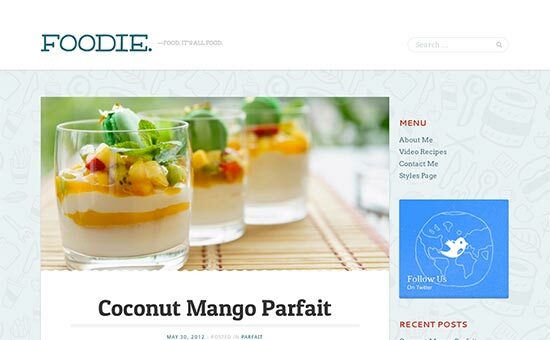 As the name suggests, Foodie is a WordPress theme for food, family, and healthy living blogs. It comes with a recipe-builder, just enter ingredients and quantity and it will create beautiful lists for you. A food or family blog is incomplete without lots of photographs. Foodie focuses on beautiful display of photographs, large featured images and beautiful thumbnail displays. 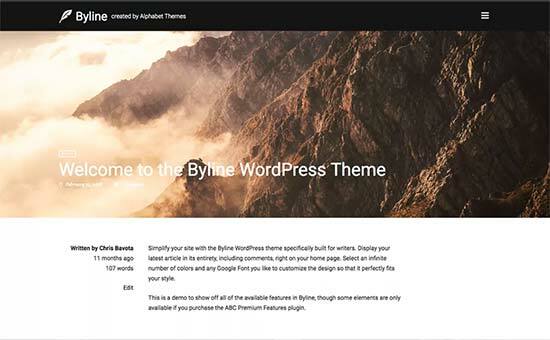 Byline is a beautiful free WordPress blogging theme. 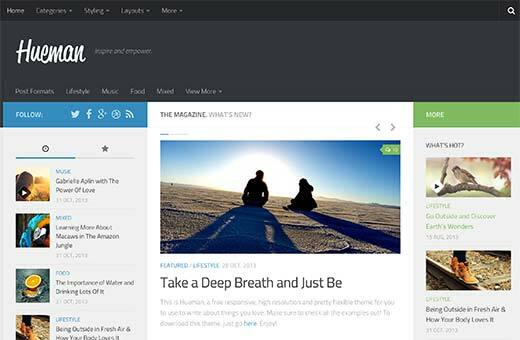 Designed to be a community centric theme, Byline displays entire articles including comments on your homepage. It comes with a beautiful unique layout focusing on readability and photographs. It comes with custom header, featured image headers, custom background, editor styles, widget ready areas, and a beautiful sliding menu. That’s all, we hope this article helped you find the best WordPress theme for your family blog. You may also want to see our comparison of the best WordPress photo gallery plugins. With genealogical research, and reporting/sharing with family members, being such a hot topic around the world, I thought at least one of your themes would recommend this by name. I am the family genealogist and would like to set up a private blog to share recent research finds with the rest of the family around the world. ‘Finds’ would include text explaining a census record (as an included photo), a cemetery headstone, an old newspaper clip, etc. Which theme(s) would you recommend? I agree. I’ve been searching for some time for a good theme for a family history website.